OurEnergyPolicy.org | Should The Renewable Fuel Standard Change With Fuel Demand? A recent editorial in the Wall Street Journal, co-signed by Rep. Patrick Meehan (R-Pa.), argues that growing renewable fuel obligations under the federal Renewable Fuel Standard (RFS) have come into direct conflict with declining U.S. demand for transportation fuel. The editorial asserts that current fuel distribution infrastructure and automobile engine guidelines limit the amount of ethanol that can be blended into gasoline to 10 percent, creating a “blend wall” beyond which further blending of ethanol becomes economically unreasonable. Meanwhile, in response to high fuel prices, consumers have radically curbed their driving habits and sought out new cars that meet more stringent fuel efficiency (CAFE) standards, setting demand for gasoline on a long-term downward trend. This trend means we’ve arrived at the 10 percent ethanol “blend wall” faster than anticipated. And, because the RFS mandates an increasing volume (rather than percentage) of renewable fuels in the U.S. transportation mix, biofuels will have to represent a percentage of total fuel mix, above this 10 percent “blend wall”. The House Energy & Commerce Committee and the Senate Environment & Public Works Committee have been examining this potential conflict since April this year. The Environmental Protection Agency (EPA) also indicated in its 2013 rule that it may lower the statutory volumes obligation when it issues the proposed 2014 rules, in order to “alleviate current market conditions.” And two petroleum industry trade groups have formally requested that EPA waive significant portions of the 2014 volume obligations. However, in our attempts to resolve the ethanol blend wall issue, there are other trends and solutions – some already in action – that should be considered. While market demand for gasoline has declined, demand for diesel fuel – also obligated under the RFS – continues to hold steady or increase slightly. Advanced biofuel commercialization continues, offering additional options – such as biobutanol, green gasoline, renewable diesel and jet fuels – for meeting the RFS volume obligations. Cellulosic biofuels, within the advanced category, have reached the tipping point for commercial deployment, with the first two large-scale biorefineries beginning to produce fuel (and RINs) and several additional biorefineries set to complete construction in the coming years. And, as biofuels groups and some economists have recently suggested, the best way to overcome the ethanol blend could well be to simply leave the RFS alone. What market-based solutions exist to reconcile the blend wall? Should EPA use its statutory authority to adjust the RFS obligations for 2014 and beyond? What impact would a change to the RFS obligations have on investment and commercialization of new advanced biofuels? What market-based solutions exist to reconcile the blend wall? 10 Responses to Should The Renewable Fuel Standard Change With Fuel Demand? Rational, bipartisan revision of RFS was perhaps our biggest opportunity for really important energy legislation through 2016. It is tragic that polarized thinking and other issues have prevented serious discussion of the real opportunity. The real opportunity is more technical than the extremes of “get rid of RFS” and “just extend the blend wall.” For Senator Specter in 2009, I reviewed the regulations implementing the RFS laws, and they are half the problem or more — though legislation could fix the problem. (See section 2 of the bill posted at http://www.werbos.com/oil.htm. Reid said he would be happy to move the bill “after we get a climate bill passed.) If we demand a bit more alternate liquid fuel than under RFS, but make it easier to meet that demand by qualifying more fuels and technologies, we create a “win-win” change that reduces costs, helps national security, and creates new market opportunities for the farm sector. Some folks say “just switch to electricity,” but the IEEE National Energy Policy Recommendations (NEPR) support the view that we are better off if we exploit COMPLEMENTARY approaches to greater long-term security. Central planning is uncontrolled experimentation. Most experimental scientiests know uncontrolled experiments rarely turn out well and never as intended. Witness the debacle in healthcare policy just beginning to unfold. The “Affordable Care Act” imposed “market-based solutions” seeking to incentivize certain behavior so as to manage costs, and reduce individual risk by extending coverage. We are watching the utter collapse of the individual health insurance market as more people lose their insurance than sign up. The insurance cost structures unfolding are tending towards even higher healthcare costs and furthering underemployment. Of course, such outcomes might have been the intent all along by those seeking a single-payer healthcare system. While this forum is about energy policy, the lessons of central planning are universal. Centrally planned solutions, be they market-based or simple government commands, never achieve their stated goals. The so-called “blend wall” controversy underscores the dynamical nature of energy markets and the absurdity of EPA policy. EPA’s ethanol policy is a fool’s errand, start to finish. Global climate is not amenable to engineering GHG emission rates. Centrally-planned attempts to engineer are fruitless at best and more likely to have undesirable unintended consequences. The best energy policy regarding ethanol is no policy. Of course, that is certainly not going to happen anytime soon. Under most circumstances I would agree that government interference in a market is unwarranted. But I make a strong exception for a market that has become dominated by a single player that competition and innovation and harms consumers. The harm to consumers of continued reliance on petroleum is clear — for several years now consumers have paid more money to purchase fuel, while receiving and using fewer gallons. Demand destruction through high gas prices is responsible for about three quarters of the recent decline in transportation consumption. And the only relief from high oil prices in recent years has come at the cost of a worldwide economic recession. I wonder if anyone else would agree that this merits intervention? Or are we to believe that the petroleum industry’s lock on the transportation fuel market benefits consumers? Contrary to the position of the Biotechnology Industry Organization, the harm to consumers from continued reliance on petroleum is not clear at all. But let’s focus on the rationale for BIO’s claim – that consumers have paid more money to purchase fuel, while receiving and using fewer gallons. As a matter of fact, sure, nominal oil prices are high. Most asset class prices are at all time highs. Well, if you consider the statistical evidence recently presented by the research staff at the Fed (citation available to anyone on request), it’s precisely BECAUSE of the “carry trade” – the natural response to the central bank’s quantitative easing reflating the credit bubble for all asset classes, including crude oil. What that means is central planning – in this case, the injection of several trillion dollars into the economy by the central bank – raises the price of all asset classes subject to storage effects. In effect, “front running” the Federal Reserve’s credit bubble. The carry trade has taken the S&P to new heights even as capacity utilization rates are in the range of historic lows. The carry trade has also pumped up the prices of all commodities – crude oil prices, aggies, metals. BIO more intervention to its own benefit. But, more intervention is simply more fuel on the fire. So, if the purported goal of intervention the ethanol industry proposes is to help consumers – rather than the ethanol industry – perhaps the industry might advocate the immediate halt in central bank intervention. The “blend wall” concept is an invention of biofuel advocates. It is an attempt to cover up the simple fact that on the scale mandated by the RFS biological systems cannot currently compete on a cost basis with fossil fuel. While that day may arrive at some point in the future, it is not here yet. At the EISA RFS scale feedstocks that could potentially compete, namely starch and sugar, are priced out of the market by the increased demand for them contained in the mandate. Put another way, the 2007 RFS helped create the “blend wall”. In fact, at no point in time since we started using meaningful amounts of fuel ethanol has it been priced energy competitive with regular gasoline. The attraction as an octane agent does allow a price premium, but current engines need only E10 for octane. Attempts on the part of policy to push ethanol past its inherent limits result in market distortions, higher fuel costs, and waste. The only solution is to base the ethanol RFS on the E10 blend. If and when ethanol can compete at higher blends the market will encourage additional ethanol production, just like it did before the first RFS, when octane value drove production higher almost every year. One would assume by “market-based” that Mr. Carr refers to the free market, but there is nothing about the Renewable Fuel Standard (RFS) that remotely adheres to that concept. There is no “market-based” solution to the blend wall if the federal government is forcing, via mandate, large quantities of biofuel into the fuel supply that consumers do not want and engine and infrastructure cannot handle. Regardless of the hype from the ethanol lobby, consumers have demonstrated little interest in fuels containing higher concentrations of biofuels. The biofuel industry, however, not only feels entitled to a mandate for its products, but also expects other businesses to pay billions of dollars to overhaul refueling infrastructure to deliver its products to consumers. The vast majority of these businesses – over 95 percent – are independent retailers that are not owned or operated by oil companies. For the relatively few stations that refining companies do own and operate, the ethanol industry’s position is equivalent to telling McDonalds that it has to sell Whoppers because Burger King doesn’t think it can build its own stores to compete in the market. Cable television didn’t ask the networks to deliver its services to households, but instead invested and built the necessary infrastructure because the industry believed it had a valuable product that consumers wanted. 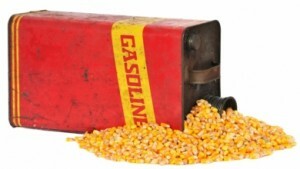 The RFS has unfairly been characterized as an argument between “big oil” and “big ethanol.” But that assessment ignores a long list of automakers, environmental groups, agriculture producers, global hunger advocates and Members of Congress who understand and have expressed concerns over the negative impact of the RFS. So many industries and individual livelihoods are threatened by the RFS mandates that 169 policymakers from both sides of the aisle sent a letter to Environmental Protection Agency (EPA) Administrator Gina McCarthy yesterday urging the agency to rethink 2014 blending requirements to prevent additional harm to American consumers. In fact, EPA itself acknowledged the problems associated with the blend wall in the preamble to its rule implementing the biofuel mandate for 2013. There is one obvious market-based solution – let all fuels compete in a free market and ultimately consumers will choose the fuels they want. Fuel, like any other product in the market, should be driven by consumer choice and not by mandates. Ultimately the best market-based solution is to repeal the RFS. The arguments here are reminiscent of the 25-year battle to remove lead from U.S. transportation fuels — it will damage cars, it will be too expensive, the technology doesn’t exist, it’s up to the automakers, etc. The clear benefit to the U.S. public of removing lead from gasoline should have kept the government focused and committed — yet, there were multiple legislative, regulatory and court delays. The short response here is that the U.S. transportation fuel market is not free — it is highly controlled through regulation. It’s interesting to note that a significant percentage of the renewable diesel used in the United States is independently marketed as 100% biodiesel. Demand for that product is a combination of availability and preference, assuming price is roughly equivalent. But even if ethanol producers were to independently market E85, they’d be dependent on the oil industry for a minimum 15% of their product. The petroleum industry’s willingness to provide a viable blendstock to ethanol marketers would allow them to control the market. There is also the “merchant refiners,” who for one reason or another do not directly market refined products, complaining about their ability to comply with the RFS. This is a long-standing debate over the rules for the RFS. So would you argue to them that it is their responsibility to build their own distribution systems? Current December futures prices are $2.60 for RBOB, $1.65 for ethanol, and $4.29 for corn. By my calculations, the December futures price of ethanol is priced below its energy value and the variable the cost of producing corn ethanol using December futures prices is about $1.35 per gallon, which leaves some margin for ethanol plants. If EPA lowers mandates to 13 billion gallons for corn ethanol, then corn production will exceed 13 billion gallons with the marginal gallons exported, not consumed domestically because the price of ethanol in export markets will likely be higher than the price that supports E85 domestically. If mandates force some consumption of E85 beyond E10 , then the marginal gallon will be consumed as E85 in the US and the RIN price will close any gap between production costs and the incremental price of E85. Consumers have demonstrated little interest in fuels containing higher concentrations of biofuels only because E85 has not been priced to save drivers money and because E15 is not available. Recent experiments with competitive pricing of E85 shows that consumers with flex vehicles will buy E85 when it saves them money. This means that there is currently demand for consumption beyond E10. And at current corn prices, meeting at least some of this demand can be done at low RIN prices. Keeping the RFS at the E10 level makes sense if we want no additional investment in cellulosic ethanol, if we want Ford and GM to stop producing flex vehicles, and if we want to eliminate any further investment in pumps and tanks that can increase flexibility in consumer fuel choice. If, instead, we want to push some investment in infrastructure, then allowing mandates to rise above E10 is really the only way it will happen. Who pays for the infrastructure is another issue and is one that should receive some attention. Taxpayers largely paid for the infrastructure that allowed E10 to be widely available through the blenders tax credit. The oil industry is now reaping the benefits of this taxpayer-financed infrastructure by blending cheap ethanol in E10 blends. The ability to produce starch and sugar at prices that are competitive with gasoline in the future depends primarily on the price of gasoline and growing season weather. If crude oil prices stay high, then the prices of starch and sugar will be determined by ethanol’s competition with gasoline but only if infrastructure investment in fueling stations and flex vehicles allows for fuel demand to manifest itself, as it does in Brazil. Do we want this competition or not? Do we want lower carbon fuels or not? Do we want to reduce reduced reliance on fossil fuels or not? These are some of the key policy questions drove the EISA policy in the first place. they should be the questions that drive the policy in the future as well. Whether the 10% ethanol “blend wall” was reached “faster than anticipated” is beside the point. When the Energy Independence and Security Act (EISA) expanded the RFS to 36 billion gallons in 2007, it was abundantly clear to lawmakers, gasoline refiners and blenders, automakers, biofuel producers, and everyone else that meeting the law’s objectives would require substantial investment and transformative change in the fuel market. Automakers responded to EISA’s passage by immediately ramping up production of flex-fueled vehicles (FFVs) capable of operating on fuel blends containing up to 85% ethanol (E85). Approximately 15-17 million FFVs are on the road today and roughly 25% of new vehicles sold this year will be FFVs. Meanwhile, approximately 77% of non-FFVs have been approved by EPA to use 15% ethanol blends (E15). In 2014, at least 70% of top-selling vehicles will be explicitly warranted by the automakers for the use of E15. The renewable fuels industry reacted to EISA by building new facilities and investing in innovative technologies to enhance efficiency. Today’s ethanol industry has the capacity to produce 15 billion gallons annually, while biodiesel and renewable diesel producers have shown they can make nearly 2.2 billion gallons. Meanwhile, the first wave of cellulosic biofuel facilities is on the verge of commercial production. These plants will convert agricultural residues, municipal waste and other nonconventional feedstocks into fuel. The agriculture industry responded to EISA by sustainably increasing feedstock production. Farmers have invested in technologies and equipment to increase yields and reduce environmental impacts. The impact of these investments is evident; producers are harvesting a record corn crop this fall, despite unfavorable planting conditions and heat stress. Together, the auto, biofuels, and ag industries deployed countless billions of dollars in investment to create a vibrant market for renewable fuels and ensure the RFS was successful. So, how did the oil industry respond to EISA? By sticking its head in the sand, of course. By early 2009, EPA was warning that the “blend wall” would be hit in 2013 and that investments in E85 and E15 infrastructure were needed. Yet, refiners and their downstream partners turned a blind eye to clear market signals and failed miserably to prepare for the inevitable. And today, despite the strong economic incentive to use more biofuel (ethanol is $0.80-0.90/gallon less than gasoline before considering the ability to monetize RIN credits), refiners are waging war against the RFS. Instead of investing in the infrastructure needed to meet long-term RFS requirements, Big Oil has spent millions erecting technical barriers to greater biofuels use, fighting the RFS in court, running anti-biofuel advertisements, and campaigning Congress to repeal the program. EPA should not reward this bad behavior by taking the hatchet to 2014 obligations. With the exception of Big Oil, affected industries responded appropriately to the ringing signals sent by EISA six years ago. Caving to oil industry lobbyists would only punish the rational actors in the marketplace and strand billions in investment. And let’s not forget that slashing RFS requirements would impact American consumers through higher gas prices, lower farm income, fewer jobs, and more GHG emissions. EPA and Congress should continue to let the RFS work. How does EPA’s announcement of the proposed Renewable Volume Obligations (RVO) for 2014 impact the market for biofuels? What do you think of the proposed RVO?